Walter Williams, the baritone/bass multi-range vocalist of the R&B /pop/vocal group, was born on August 25, 1943 in Canton Ohio. He, along with his childhood friend, Eddie Levert began singing on the radio in 1958. They were going to Canton McKinley High School at the time and the show was a local gospel radio show. They were the founding members of the group called the O'Jays. The name was a tribute to Cleveland DJ, Eddie O'Jay who was part of of the management team along with Frankie Crocker, Herb Hamlett, and Eddie. Eddie Levert and Walter Williams, have been members of the group from the beginning. They formed the group along with four other members who came and went in succession over the years. They even went through two other names – The Triumps and The Mascots – before they settled on The O'Jays in 1963. The original group included William Powell, Bobby Massey, and Bill Isles. 1963 was also the year they released their first song that hit the top of the charts – “Lonely Drifter”. Their first album was called Comin' Through. The 60's brought them more top of the chart songs, including “Stand Tall”, “Let It All Out”, “Look Over Your Shoulder”, and “One Night Affair”, to name just a few. In '72, they finally had their first million-seller with the song “Back Stabbers”, on the album with the same name. "For The Love of Money" (Pop #9)"
"Darlin' Darlin' Baby (Sweet Tender Love"
Unfortunately, in 1977 one of the original members, William Powell, died of cancer at the age of 35. They added Sammy Strain a former member of Little Anthony and the Imperials, but only had one Top Five hit - “Used ta Be My Girl” in 1978. In the 80s and 90s they had more chart hits in the US and in the UK as well. Their one last R&B #1 hit was “Lovin' You” in 1987 on the album Let Me Touch You. In 1992, Sammy, left the group to go back to the Imperials. He was replaced by Nathaniel Best, and then by Eric Grant. They did many live appearances in the late 90s, but not much recording. In 2004, they recorded their latest album,Imagination. 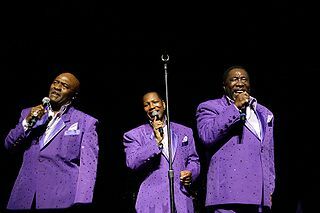 The O'Jays also began doing movies, one of them, The Fighting Temptations in 2003. They co-starred with Cuba Gooding Jr. and Beyonce Knowles. The O'Jays played the parts of three barbers who joined the local church choir to help the choir director, Darrin, played by Gooding. Other stars included Angie Stone, L'il Zane, Melba Moore, and Montell Jordan. With 2005 came the honor of being inducted into the Rock and Roll Hall of Fame. Walter Williams and all of the original members, except for Bill Isles, as well as Sammy Strain, who had also been inducted with The Imperials in 2009. In 2006, the O'Jays performed the song, “For the Love of Money” at the ESPY awards. This song is also the theme song for Donald Trumps reality TV show, The Apprentice. To read more about Walter Williams and what happened when he was diagnosed with MS, click here to go to Part 2. He also has a website - Walter Williams Sr(Link opens in a new window).